The Beautyrest Fusion Aire Express Bed With Built-In Pump offers exceptional comfort and support. 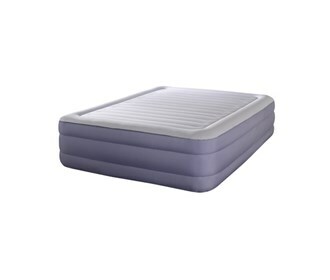 Simple and fast to inflate and deflate, this airbed is the perfect solution for an extra bed in any room. Oval Beam construction with perimeter support maintains a flat, smooth comfortable sleep surface and prevents roll together. PolyFusion™ technology provides a firm support all night long and supports up to 850 lbs. The Beautyrest Fusion Aire Express Bed With Built-In Pump has many exciting features for users of all types. See the Beautyrest Fusion Aire Express Bed With Built-In Pump gallery images above for more product views. The Beautyrest Fusion Aire Express Bed With Built-In Pump is sold as a Brand New Unopened Item.